Is it normal that you have to stop the E-string higher than on the rest of the strings? It's not a tuning problem, as all the strings are tuned well. But it seems the higher you go with my E-string the lower note it produces than supposed to be, as if the rate on which the note gets higher is slightly lower. I've searched the Internet and saw someone asking a question with a problem that seems to be the same, but in his case it appears to be the string's fault being worn out. I don't think that is the case for me, as my strings are rather new and the problem seems to have existed before I last replaced the strings, though I didn't try double stops back then I think I had to stop it higher than say, on the A-string. I also don't know if this is actually the case for all violins and if it's normal, but I personally think it's a problem. It's also difficult to know whether or not you are at the same distance with your forth finger on the G vs D, A or E.
Old E strings tend to react differently with regards to intonation vs finger placement. I sometimes have for example difficulty playing perfect fifths on old strings. With that I usually change the E string for a solution. I don't know if other strings react as much as the E string does. Not from my experience in any case. Can you please tell me what Perfect Fifths are? You violin is tuned in 5ths, which means that the forth position on the G string is the same note as an open D.
The 4th position on the D is an A and the 4th on the A is an E.
Exactly. 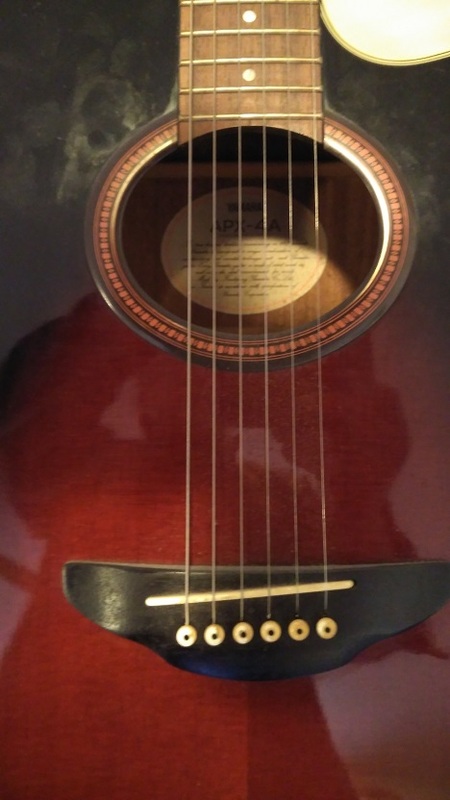 So in respect to your forth finger needing to come down higher on the E string, if you play E on the A string at the same time as playing B on the E string, they would normally be close to perfect. Almost exactly the middle between B and A#! Tune your violin as precisely as possible, with the best/most accurate tuner you have, preferably one that either resolves to actual Hz, or displays steps say down to 5 or 10 cents. Pluck the A string (until you find the E). Keep the biro pen as close to 90 degrees to the strings as you can - eyeballing it will be sufficient. Pluck the E string - what does the tuner say ? If it is not within a few cents of B - sure - something strange is going on ! ---- I referred to this earlier - the "physics" - on my acoustic guitar the bridge / saddle is tilted, making the low E longer than the top E. (It is also the same on my electric guitar where there are individual adjusters for each string in the saddle) This is because heavier strings require to be slightly longer than lighter strings - for a number of subtle reasons I won't go into. So yes - there are marginal differences, but surely nothing like half a semi-tone. I would definitely try the little experiment I suggested..... Try it and let us know- there are a number of other potential "contributors" to the effect - like very subtle things - such as how the string curves over the nut, how high the "action is", the material of the E-string (often different, or even, by choice a string from a different manufacturer) to mention but three. The other thing to keep in mind is that intonation (by a player) is rarely perfect - it can be darned close - but rarely perfect - although a 50 cent error as you describe is certainly going to be heard by the listener. LOL - time I gave it a wipe-down !!! Turns out it WAS the strings, they wear out more quickly than I thought. Thank you for all the replies though!